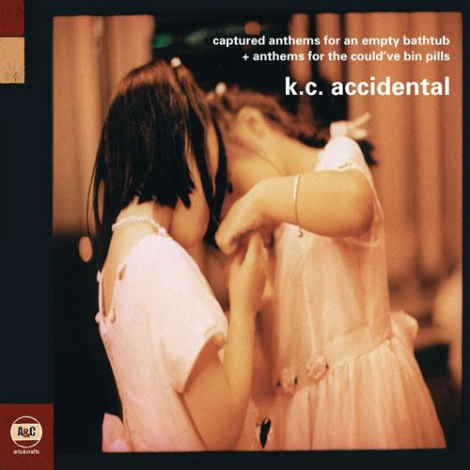 Before there was Broken Social Scene, there was KC Accidental. Alo-fi bedroom duo of BSS’s founder/vocalist/guitarist Kevin Drew and multi-instrumentalist Charles Spearin, the two were laying the foundation for the Toronto collectives sprawling expansein the form of two self-released EPs made at the end of the 90s: Captured Anthems For An Empty Bathtub and Anthems For The Couldve Bin Pills. The two EPs were initially put out in limited numbersNoise Factory Records and now have been out of print for five years, also never available outside Canada. This fall, Arts & Crafts will be reissuing these EPs in one package on October 26th in 2-LP, 2-CD and digital formats. Pre-order the album at GalleryAC.com or at the merch booth at BSS’s North American Tour. Head to the myspace page to take a listen. I recommend “Them (Pop Song #3333)”, which features Emily Haines (pre-Metric days).